Recombinant monoclonal antibody to CD131. Manufactured using AbAb’s Recombinant Platform with variable regions (i.e. specificity) from the phage display antibody CSL311. Immunogen: CSL311 was raised by Fab phage display against the entire recombinant extracellular region of the βc homodimer (CD131). Specificity: This antibody binds to human CD131, also called the cytokine receptor common subunit beta. 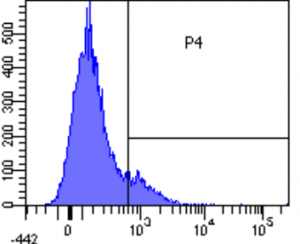 Application Notes: This antibody binds to the common beta chain of the IL3-, GM-CSF- and IL5-receptor and prevents binding of the corresponding cytokines to these receptors and resulting in pro-inflammatory signalling as assessed by inhibition of TF-1 cell proliferation and STAT5 phosphorylation. Flow-cytometry on human lymphocytes using Ab00652. 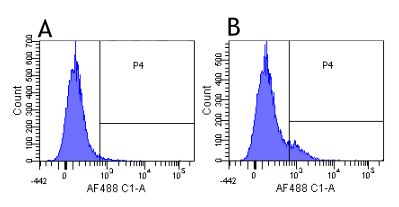 Flow-cytometry using the anti-CD131 research biosimilar antibody CSL311 (Ab00652) Human lymphocytes were stained with an isotype control (Ab00102-23.0, panel A) or the rabbit-chimeric version of CSL311 (Ab00652-23.0, panel B) at a concentration of1 µg/ml for 30 mins at RT. After washing, bound antibody was detected using a AF488 conjugated donkey anti-rabbit antibody (ab150073) and cells analysed on a FACSCanto flow-cytometer.